1. The language and vocabulary are extremely practical, so there is a chance that I will actually use the stuff I memorise. 2. There is a lot of vocabulary. A problem faced by all language learners is that you need a lot of vocabulary to participate in basic conversations. Many language courses only use 400 words or so. 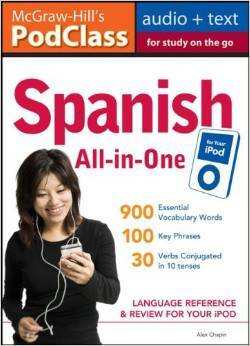 I’m using the McGraw-Hill Spanish All-in-One kit ( ISBN-10: 0071627669 , ISBN-13: 978-0071627665). It has 300 basic phrases, the conjugations for 30 verbs and around 900 different words to learn. It has audio recordings by a native speaker of all the phrases. This is very important because I do not want to memorize the phrases perfectly only to pronounce them incorrectly. I especially like it because the individual phrases are recorded as separate mp3 files, which makes adding the phrases to my Anki cards easy. I don’t have any affiliation with McGraw-Hill or anyone involved with this book. I was going to use McGraw-Hill’s iSpeak Spanish, but it seems to be out of print. The Spanish All-in-One kit seems to be an updated version of iSpeak Spanish. I successfully memorised 70 phrases this week . I didn’t get time to memorise 10 on Saturday, so I made up for it by memorising 20 on Sunday. Entiendo un poco de español (I understand a little Spanish).